Antrim (named after the town of Antrim) was a local government district in Northern Ireland. It was one of twenty-six districts created in 1973, and was granted borough status on 9 May 1977. The borough covered an area of some 220 square miles (570 km2) and had a population of 53,428 according to the 2011 census. It was situated about 19 miles (31 km) north-west of Belfast. 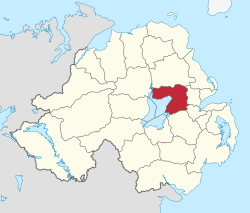 It bordered the north and east shores of Lough Neagh, the largest fresh water lake in the United Kingdom, and included the towns of Antrim, Toomebridge, Crumlin, Randalstown, Parkgate and Templepatrick. The council headquarters were located on the outskirts of Antrim town. Although the borough was not within the Belfast Metropolitan Area, it housed the city's international airport and many commuter villages. Antrim (borough) Facts for Kids. Kiddle Encyclopedia.